AJ Green – Is He Worth the Investment? 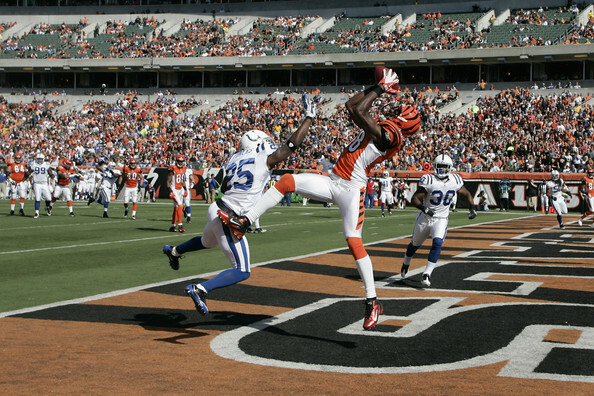 There is no disputing the fact that Bengals wide receiver A.J. Green is one of the most promising players at his position in the league. As a result of his superior talents, Mr. Green has been the focal point of the Bengals offense since his arrival in Cincinnati. Despite the coaching staff’s declarations that the Bengals are a run first team, it is clear that getting Green the ball is the major priority for the Bengals – this past season he was targeted 180 times, second only to Pierre Garcon and Andre Johnson in the entire NFL. Additionally, Green had the fifth most receiving yard in the NFL this past season. Given his age, talent, and upside, there seems to be no limit to AJ’s production, right? The answer is obvious – A.J. Green has the tools and attitude to make him the best receiver in the NFL. However, the (unpopular) question remains – is A.J. Green going to be worth the money for the Bengals to retain his services? On the surface, the answer seems clear – A.J. Green is one of the top receivers in the league with virtually unlimited potential. He is someone you can build a franchise around, right? Unfortunately, and this is my personal opinion, but I believe league-wide results support it; a single receiver will never push a team from a contender to a champion. Josh Gordon was arguably the most dominant WR in the NFL last season, yet his team finished 4-12. Calvin Johnson, possibly the most freakish professional athlete ever, regardless of sport, played on a 7-9 Lions team last year and has never experienced a playoff victory. And then there is Randy Moss…he joined the New England Patriots, the epitome of recent success, and posted some of the best numbers of his career during Tom Brady’s best season. On the way he helped the Patriots reach a 16-0 regular season record. He revived his career and was once again putting up numbers worthy of an elite receiver, yet the Patriots still fell short in the Super Bowl to the Giants, a team full of mediocre receivers. Ultimately, A.J. Green is one of the most talented players in the NFL, but recent history suggests that having one of the top receivers in the NFL does not guarantee a Lombardi Trophy, much less sustained playoff success. Given the depth the Bengals have at the WR position (Sanu could legitimately become a dominant force in the league given his physicality and surprisingly refined skill-set), I just can only hope they don’t handcuff the franchise for years by offering a maximum contract to A.J. Green. This is not to say that Green doesn’t deserve a massive payday, but rather that if he is going to make around $20 million a year, the Bengals (and any team hoping to compete) should not pay “elite” quarterback money to a WR simply because of positional value – you can find productive receivers at league-minimum wages. I would love if A.J. Green spends his entire career in Cincinnati. He is already considered a top-5 receiver in the league, and all of his weaknesses are correctable. Personally, I think the Bengals should do everything possible to resign A.J., so long as it does not compromise the long-term vision of the team. While receivers get top dollar contracts, it is clear that having a star receiver is not crucial to winning a championship (Golden Tate would have to fight to even be part of the Bengals WR rotation despite being the number 1 option on the reigning Super Bowl champions…). Future success for the Bengals relies upon, primarily, the play of quarterback Andy Dalton and the defense. While Green is one of the top talents in the league, Super Bowl champions either have a great QB, a superior defense, or some combination of the two. Given that a receiver relies entirely upon a quarterback for production, I just don’t see how it is feasible for the Bengals to invest the money required to retain A.J. Green long-term. Many fans would view losing A.J. as the final straw in supporting the Bengals, but is it worth paying Calvin Johnson money to ANY receiver when the NFL is a QB driven league? Yes, A.J. Green is one of the best talents to reach the NFL in recent years and the Bengals should try to resign him, but only if the salary cap impact doesn’t set the Bengals back to their 1990’s form.